Control cabinet provides for 20 inputs and 20 outputs for connection to various sensors and switches on the crimp press. An aluminum reel clamp with integrated micro switch provides a signal every time the terminal reel is changed. The operator is required to scan the terminal part number and measure the crimp height. A sensor is installed in the base plate under the applicator. Every time the applicator is removed the operator is required to measure the crimp height. A Crimp Height Micrometer is set at each crimp press and must be used at setup time, at every reel change and whenever the applicator is removed. Groups of crimp presses can share one pull tester, cross section station, bend angle station. "Smart" choppers can be installed at each press to assure accountability of all crimp defects. 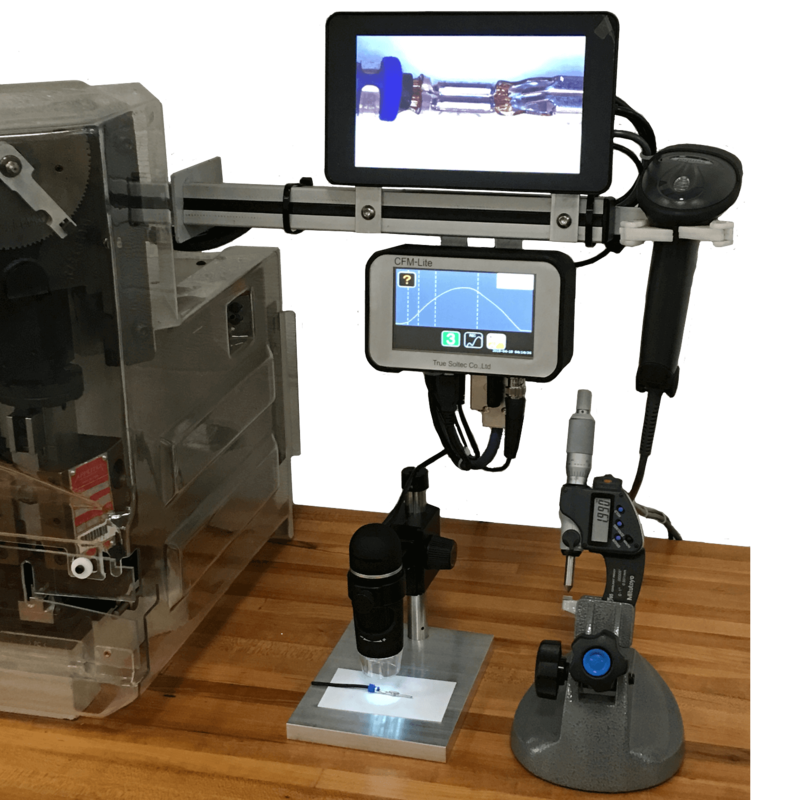 Inexpensive, compact USB microscopes can be installed at each crimp press for visual inspection and saving of pictures for traceability. MPN 100 is a comprehensive network system designed for manual crimp presses. All your manual presses are connected wirelessly to a server PC. The server PC has a database with all the relevant data for each circuit like terminal part numbers, crimp heights, pull test values, wire part number, applicator ID, seal part number, etc. At setup time a barcode scanner is used to scan worker ID, wire part number, terminal part number, applicator ID. A complete setup validation is required including visual parameters, crimp height measurements and pull test. Any and all data related to the daily production is captured and stored. MPN 100 can also interface with Crimp Force Monitor, "Smart" chopper, Cross section station, Bend angle station, USB microscope.